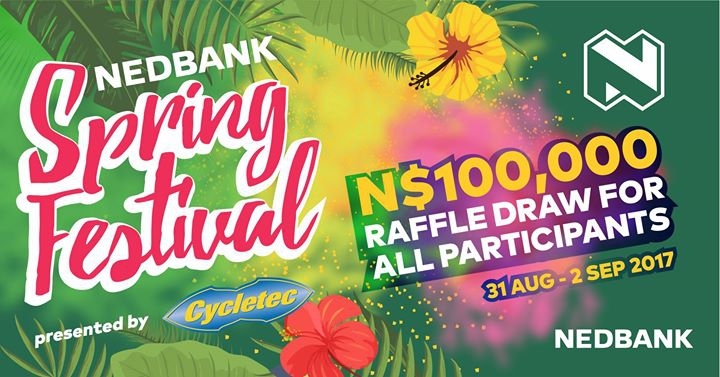 2017 marks the 19th edition of the popular Spring Festival, and is the 5th year that Nedbank Namibia is the title sponsor. Traditionally the event is held on the 1st Saturday of every September to celebrate the arrival of Spring, with warmer weather and longer days. For 2017 the event, however, Nedbank and our supporting sponsors are going big!! Thursday evening.Building on the festival theme, Friday night will offer a trail run and mtb ride, with live music and a food market at the finish.Finally, Saturday will see runners, walkers, mountain bikers, dog lovers, Crossfitters, gymnasts and many other outdoor enthusiasts hitting the popular trails around the Avis dam. Once participants are finished they can lounge in the sunshine, while eating great food and listening to live acoustic music by local artists. A N$100000-00 lucky draw for all participants at 12h00 is the cherry on the top of the Spring cake! !